The NFB of Kansas President dropped by for a quick visit and tour this afternoon. Tom Page and his friend Nicole are in the area with Tom’s string band, the Haymakers. They played in Colorado Springs last night and will be in Denver at Cervantes’ Other Side tonight. Though a number of Kansas students have come to CCB for training over the years, this was Tom’s first chance to see the Center. “The energy is amazing,” he said. Tom and Nicole bumped into another Kansan this afternoon while visiting. Luther Fuller is part of the Summer for Success (College Prep) Program this summer. He’s just graduated from high school and is off to college in the fall to major in Music and Computer Science on the side. But Tom almost missed seeing Luther. 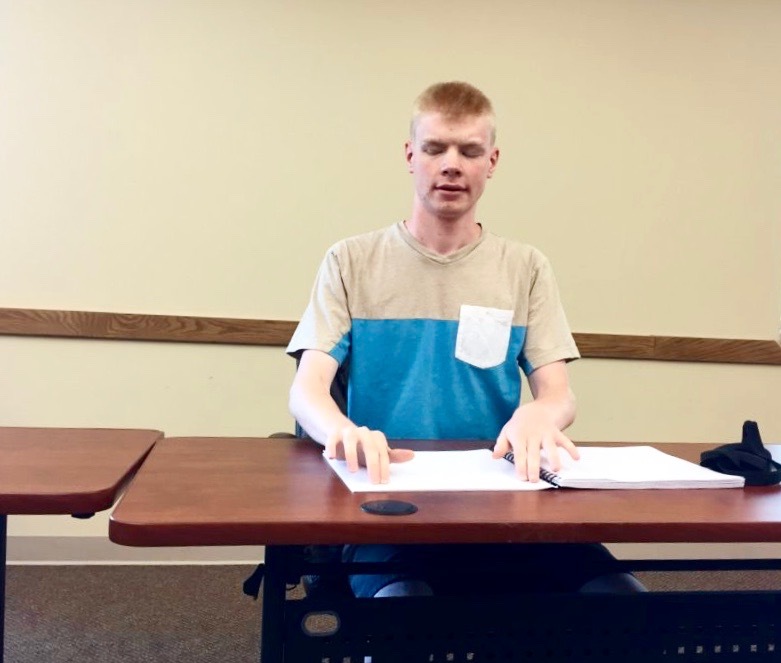 the younger Kansan is flying to Los Angeles in the morning to compete in the National Braille Challenge at the Braille Institute, representing Kansas of course. It’s Luther’s 7th trip to the competition – and his last. He ages out of the competition this year. So if you’ve read this far you’ll be delighted that we recognize our longest-standing connection to Kansas – Tom and Linda Anderson. Tom and Linda came to Colorado in 1987 to help open the doors of CCB in January, 1988 – 30 years ago! That’s back when CCB was an upstart start-up in the world of rehabilitation training for the blind. But our founding staffers knew where we were going with training blind people, and Tom Anderson was rock-steady as a teacher, mentor, role model and rock-climber. 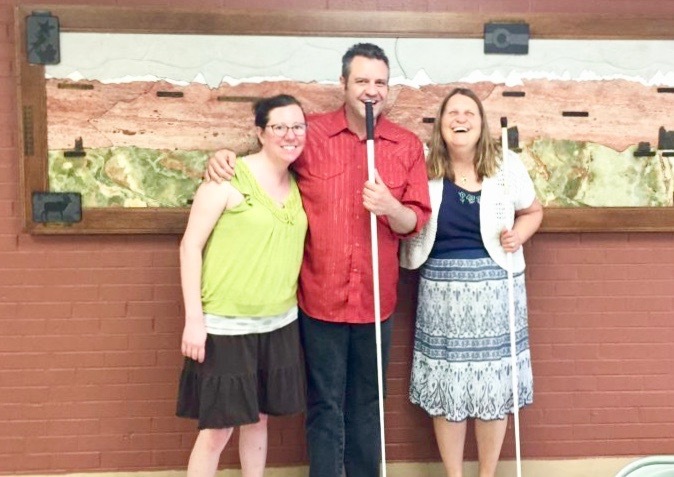 Tom retired in 2015 after 27 years as Braille Instructor, when he and Linda returned to Kansas. They are both active in the NFB of Kansas, and pretty darn busy for retired people! So, here’s your shout out Dr. Dots! May the Kansas Connection Continue!